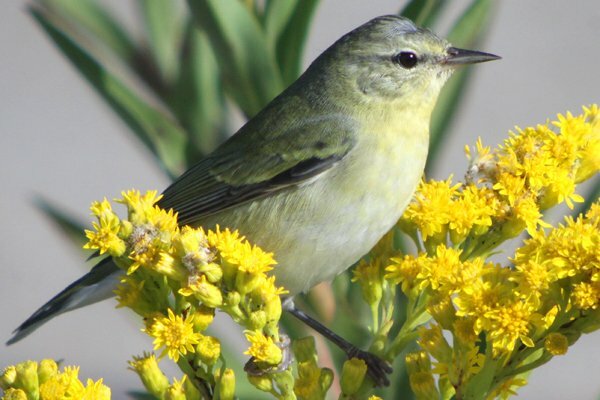 The Tennessee Warbler is a poster child for the boreal forests of Canada and the far northern United States. Its population actually fluctuates in response to the availability of Spruce Budworm and though it nests on the ground it is entirely inseparable from the forests of the north during breeding season. As autumn arrives and the days get shorter and cooler Tennessee Warblers make their way south to Central America and northern South America, sometimes as far south as Ecuador. 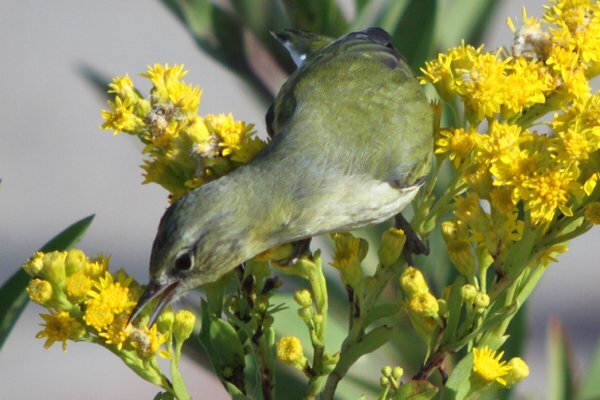 On their wintering grounds they switch from a bird with an appetite for caterpillars to a bird that robs plants of nectar by piercing the base of flowers with its pointy bill and drinking it. 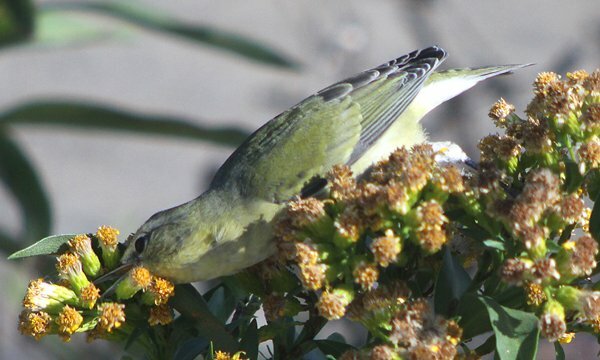 Of course, the Tennessee Warbler never entirely loses its insectivorous ways and it will eat whatever bugs it finds in the flowers as well. During the winter months, this species is found in a wide range of tropical forest habitats, but is particularly well-known for a strong affinity to coffee-growing areas. According to pioneer Neotropical ornithologist Alexander Skutch, “Coffee Warbler” might be a more appropriate name than Tennessee warbler. This species forms large mixed-species flocks and is very abundant in coffee plantations grown with an overstory of shade trees, especially those from the abundant tree genus Inga. 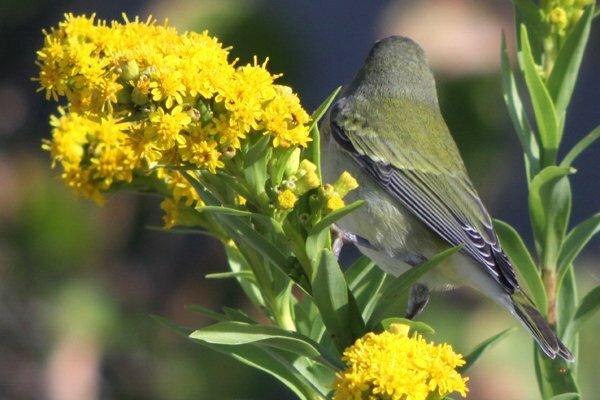 When the Inga is in bloom, Tennessee warblers can be the most abundant bird found in coffee habitats. The nectar from Inga flowers provides an important food resource during the winter dry season throughout Latin America. The bird in the images in this post was spotted in fall so it in mostly basic plumage, not surprisingly. 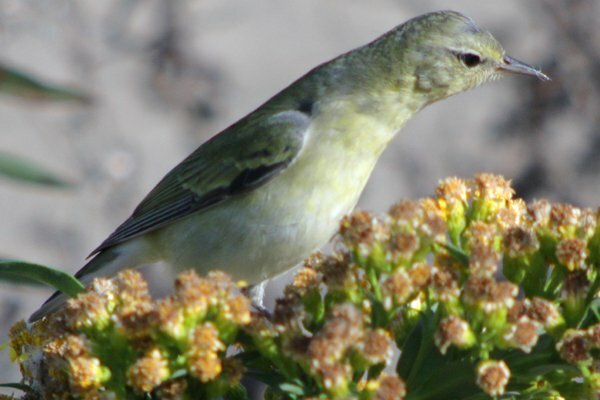 What is surprising is that the yellowish coloration of a first year Tennessee Warbler in fall is actually as bright if not brighter than birds in breeding plumage, which in males is a relatively drab blue-gray, green, and white and for females is greenish, yellowish, and white. Even more surprising is that Tennessee Warblers often molt and migrate simultaneously, a strategy that few other birds take advantage of. 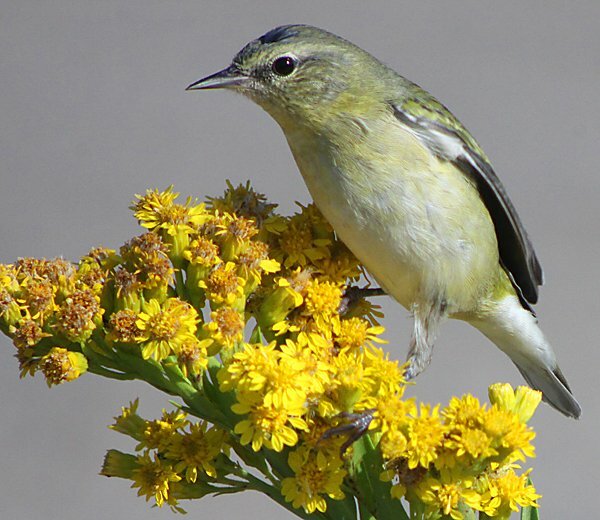 The bird formerly known as Vermivora peregrina and now known as Oreothylpis peregrina is not going to win any prizes for beauty among the Parulidae, or wood-warblers, but when one is seen foraging in Seaside Goldenrod the bird doesn’t have to be brilliantly colored to make a nice picture. 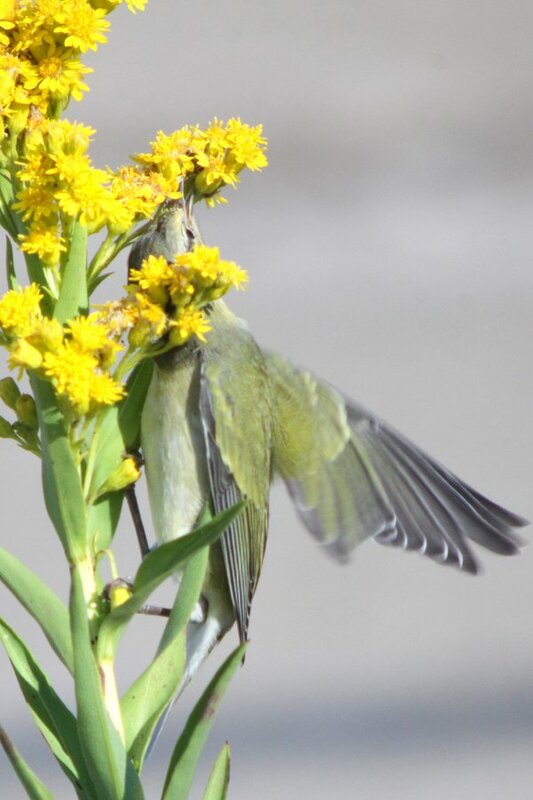 Tennessee Warblers are much more likely to be seen foraging low to the ground during fall migration: in spring they tend to forage high up in the canopy. I hope you enjoy the digiscoped shots in this post that were taken at Jacob Riis Park in Queens, New York. Beautiful bird, great photos. Does it come to Tennessee? I live on the border of East Tn and SW Virginia near Holston Mountain. @Mary Clark: It migrates through Tennessee. It got the name because that is where the type-specimen, or the bird that was collected and used to describe the bird for science, was collected. 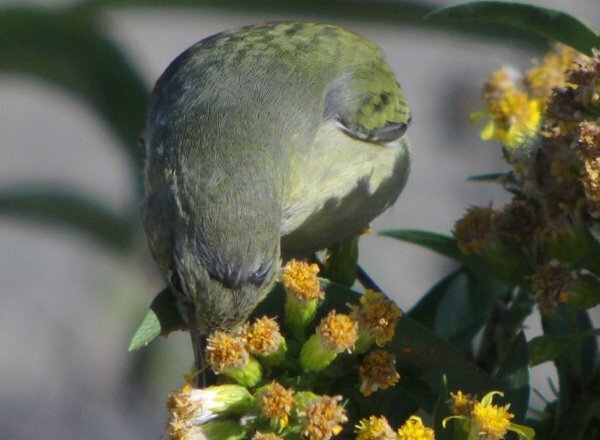 “Coffee Warbler” — now that’s a bird after my own heart! @Meredith: You and me both!